Coral bears the rather charming nick-name of “Sea’s Garden” in part because people once thought it was a plant. When you’re working with ocean energy, this crystal blossoms with protection particularly from evil influences. There’s more to this legend than meets the eye. Medusa was once beautiful but Athena turned her into a hideous creature in a fit of jealousy. Now with snakes for hair, Medusa could turn a person to stone with a glance, yet in her death her blood produced a healing crystal as beautiful as her former self. In this ancient tale Coral represents beauty out of ugliness and transformation, with the end result being immeasurable joy. The theme of transformation and change continues in the Natural realm for this healing crystal. Coral forms in warm waters from the skeletons of marine animals that live together in what could be considered a community. As the colony grows, branches form in a specific pattern much like our own metaphysical community has many facets. In this, Coral shows that as we embrace the future some of the past remains with us as a foundation while our branches embrace a brave new world and adapt to the challenges it offers. It also reminds us of the next generation of rainbow and blue ray souls coming into this world needing our protection until they learn to swim life’s oceans. It is no wonder Romans hung Coral necklaces around their children’s necks as a talisman against danger and the evil eye. Women wishing to have a child would also wear Coral as a fertility charm. Speaking of brave new worlds, there is an ancient myth that Mars was made from Coral because of its Color. As a charm, one of the most common uses for Coral amulets was fecundity, particularly Red Coral for women struggling with infertility. Nonetheless, the energy matrix of Coral is perfectly suited to the land as well. Give it to any piece of land that’s lagging or where you want to experience the richness of “Sea’s Garden” spiral outward before your eyes. By the way, Coral loves colorful flower beds. Try Astilbe hybrids that actually look like sea Coral as they grow feathery. It also enjoys being part of a water feature (the showy part if possible. Coral is not shy energetically). Bear in mind that the healing crystal Coral’s energy matrix changes depending on the hue. Red has a lot of energy and safeguards the bearer for wallowing in depression. It’s considered a purifier for the body, particularly for purging toxins. Having lived in the sea, Coral knows that the waves of life sometimes push us to ugly harsh places. In this it gives you the power to stand your ground and tame the temptation to either become “lost at sea” or release an uncontrollable emotional element that can turn into obsessiveness (and not in a good way). 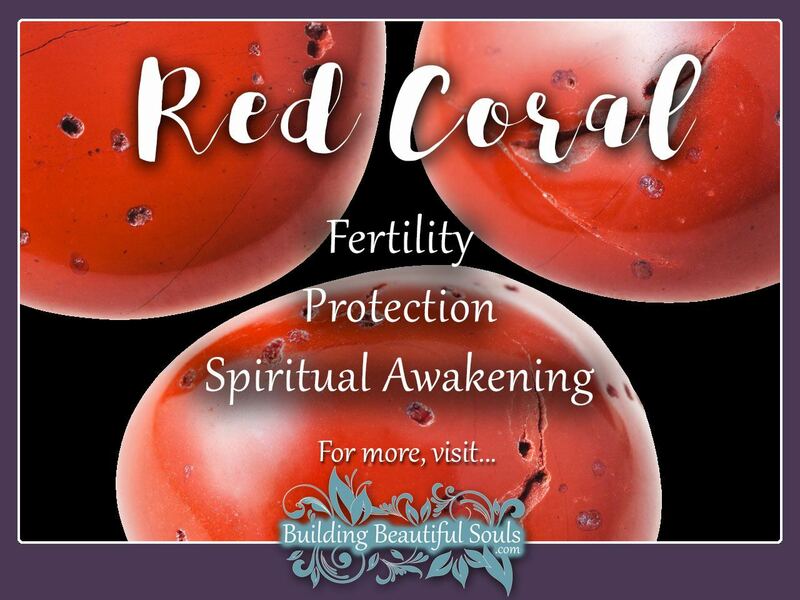 Use Red Coral (pictured in this article) here and connect with your root chakra for sure bearings. Sometimes you’ll find this healing crystal carved into images; sometimes you’ll find it attached to another healing crystal or sacred stone. Each configuration speaks to your spirit differently. If you’re not certain, read up on Sacred Geometry so you find the perfect piece and get back at the helm of your life with confidence. Various languages have a word for coral, nearly all of which translate as ‘small stone’. In Hebrew its more specific: a small stone for casting lots. Now we discover another application for coral – as a divination tool (specifically as part of a stone casting kit). In the Bible such stones determined an uncertain fate for boon or bane. In this, coral will not hedge – it’s a truth teller. For intuitive, psychic and energy readers, you could not have a better spirit guide for keeping your divination efforts completely on the up n’ up.